The website continues to slowly accrete content over seemingly geological time spans, and then thanks only to the judicious application of gaffer tape, wd-40, and a slack handful of round-tuits. New Mk2 All Sky Camera installed and operational. Presentation on "Hidden in Full View - revealing the hidden universe with astrophotography" for the Wysing Arts Center's Open Weekend 2013. Presented an "Narrowband Imaging Primer" at the Cambridge Institute of Astronomy as part of the Cambridge Astronomical Association's Astro Imaging Course. 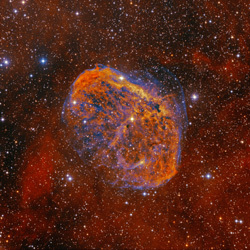 NGC 6888 - The Crescent Nebula added to gallery. Comet Pan-Starrs taken from garden with DSLR. NGC 281 - The Pac-Man Nebula added to gallery. 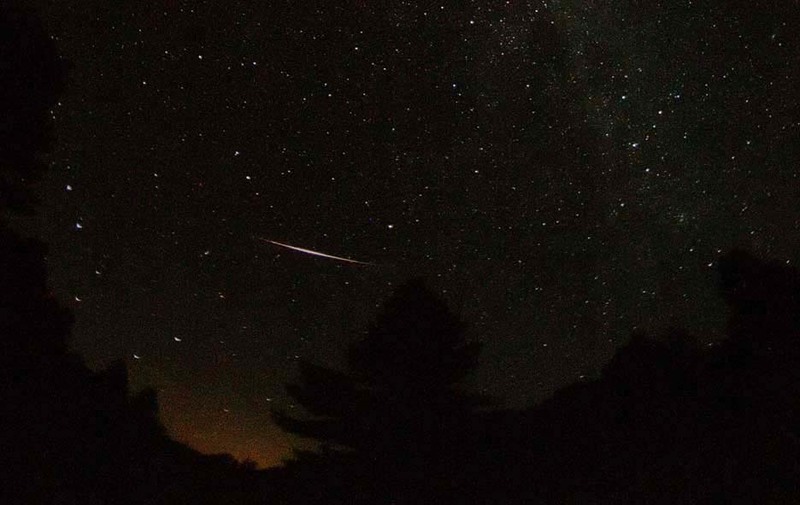 To Catch A Shooting Star - The Perseid Meteor Shower Radiant image added to gallery. Presented an "Introduction to Narrowband Imaging" at the IoA as part of the Cambridge Astronomical Association's Astro Imaging Course. The Great Orion Nebula added to gallery. Presentation on "Astrophotography and Art" for the Wysing Arts Center's Cosmos residency lecture series. Lagoon and Triffid Nebulae region HaRGB image added to gallery. Completely revamped the Weather Section pages. Presented "Astrophotography - A Whistlestop Tour" at the IoA as part of the Cambridge Astronomical Association's Star Party lecture program. 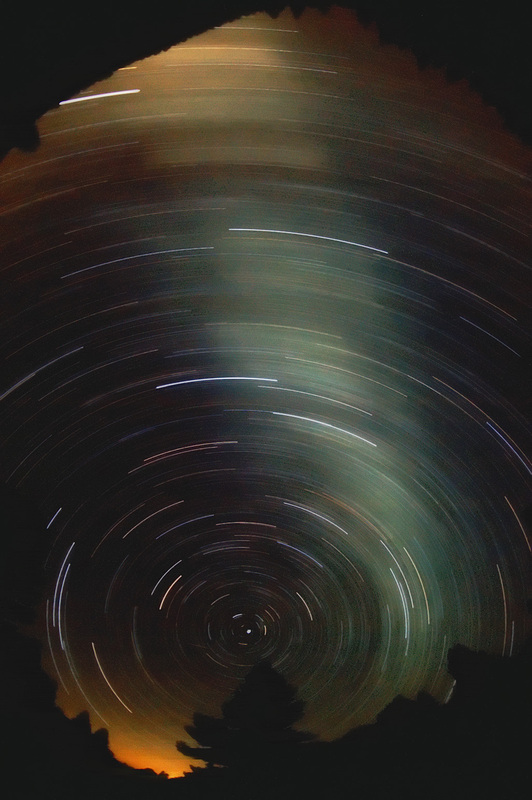 Added example all sky camera movies to the Timelapse Gallery. Added M31 Andromeda Galaxy continuum subtracted Ha image. The continuum subtracted image reveals M31's hidden central Nuclear Spiral. Abell 1185 Galaxy Group and Ambartsumian's Knot. Also added new floating thumbnail resizable gallery. New video server h/w installed for All Sky Camera after original one failed. All Sky Camera converted to colour from mono after failure old older camera. Introduced offline averaging of 8 frames per image to reduce image noise. Revised Elephant's Trunk nebula in IC1396 - colour narrowband image - sharper, better contrast and colour. Improved starless processing. All Sky Camera catches Centaur Rocket dumping fuel and DMSP-F18 satellite it just launched. Elephant's Trunk nebula in IC1396 - colour narrowband image of a cometary globule and dark nebulae embedded in an emission nebula complex. All Sky Camera continous update last hour animation loop added. Added timelapse gallery and populated with some old sequences. All Sky Camera was Offline for a while. Hopefully now more reliable. Slightly wider FOV and focus tweaked. Abell 1367 Leo Galaxy Cluster - A froth of tiny galaxies - many interacting, and a 10.3 billion light year distant quasar. Updated DSLR control cable page - Joe Zeglinski's simple modification to the design adds support for Nikon DSLRs. The Moon, original f9 first light image. Rosetta Nebula prime focus image. Gallery page created. Live weather reporting added to website. 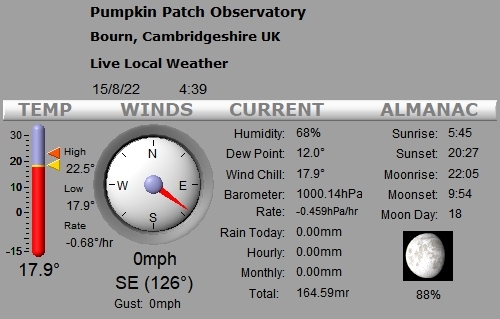 Data from cloud monitor and weather station mounted on observatory. Mysterious object in Cygnus mosaic - Solved!? Sung-Nan Lin provides likely explanation. Wow, almost a year since the last real update of the site!... New All Sky Camera project that provides real-time images and time-lapse movies of the sky, day and night, 24/7. Stay tuned for news of new observatory's construction and installation of new instruments that's been taking place over the last year. A long time since I put anything up on the site, so here's a quick update. I recently had the luck to spend a night under the stars during a pack trip in the US Eastern Sierras. I shot ~2hrs of 30sec exposures with a Canon 300D DSLR, generating a few seconds worth of fisheye lens Milky Way time lapse movie [Warning 6.4MB download]. It shows the milky way rotating across the sky reasonably well. XviD codec required. If you don't have it, the CCCP Codec Pak is a quick way to get the codec installed. Most of the firefly tracks you see are aircraft, but a few are Perseid meteors. Here's a composite star trails picture of all the frames in the movie, and a cropped single frame of the brightest Perseid from the sequence. Added the Heart & Soul Nebulae to the gallery. Reprocessed the Cygnus mosaic to better emphasise the dimmer nebulosity and dark rivers. Minor updates to DSLR serial control cable page. Finished developing generic page template for gallery items. Added image details to the Cygnus mosaic page. Basic structure in place: menus, search, translation.